Have you thought about what the best strategies are that you need in order to live a successful life, whatever that looks like to you? 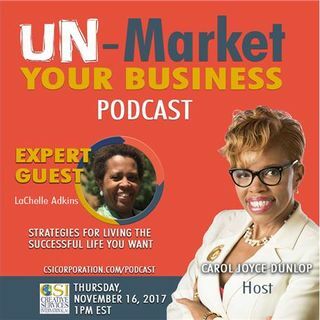 Today, my guest LaChelle Adkins unveils what you need to do and how to do it to live your best, most successful life. LaChelle knows about living your best life, she enjoys accomplishing impossible feats because she believes that it is evidence of God working in her life. She creates momentum in her life when she is faced with challenges, including raising 13 ... Maggiori informazioni children. Her goal is to leave a lasting impression on everyone that she meets and to add value to make their lives better. We will be discussing some of the obstacles that prevent us from living the life we want. LaChelle will share the strategies you need to put in place right now to improve your life. Plus she'll share with us the life struggles she encountered that made her decide to become a life coach and how you can learn from her how to make your life the best ever.